The CP-114 Series of multiport serial boards is designed for RS-232 and RS-422/485 industrial communication. 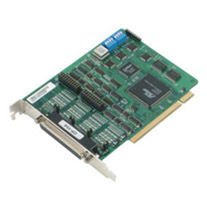 The CP-114 Series has 2 ports for RS-232 or RS-422/485, selectable by jumper, and 2 ports for RS-422/485, with each RS-422/485 port able to control up to 32 devices in a multidrop environment. By using ADDC™ (Automatic Data Direction Control) intelligence, applications can easily manage the half-duplex RS-485 port's data transmitting and receiving without the need for writing extra code. In addition, on-chip hardware flow control and built-in termination resistors guarantee data integrity, and optical isolation and surge protection options are also available to deliver high reliability. All of the above attributes make the CP-114 Series of multiport serial boards suitable for harsh industrial applications.